The Deals Dashboard — a critical component of Dealpath’s industry-leading platform — recently received a major improvement. Dealpath customers use the dashboard as their command center for pipeline tracking. It provides a 30,000-foot view of all their deals, whether they be active, closed, or dead. The new dashboard features several significant upgrades. 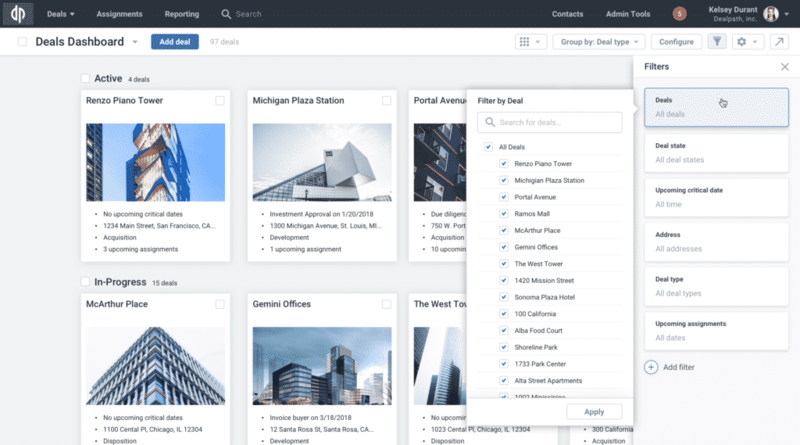 It is now faster than ever, has more intuitive options for configuring and filtering, and boasts one of the most user-friendly interfaces in the real estate technology sector. The new dashboard was completely re-architected with speed and ease-of-use in mind. The improved engineering allows Dealpath to load views at unprecedented speeds, and a design refresh makes the dashboard cleaner and more intuitive than ever. Ultimately, this means teams will be able to work more efficiently and streamline their operations. Much of the power of Dealpath comes from its limitless customizability. Every page can be endlessly configured, tweaked, and edited to achieve the most effective interface for each team. Additionally, each member of the team can also configure their individual dashboard views to their preferences. The new dashboard makes it easier than ever to build and customize those views. The upgraded dashboard now has a “Group by” button to easily organize your deals into the categories you prefer. For instance, teams can change instantly between views that group their deals by deal state, deal type, property type, or location. If certain team members prefer one grouping, they can set that view without changing those of their teammates. In addition, the “Configure” button is now separate, making it easier to customize what information is shown for each of your deals, regardless of how they’re grouped. Common fields include deal progress, critical dates, and upcoming assignments, but the number of fields is endless. Finally, the “Filter” button has an improved user interface that makes it easy to establish which deals you want to see on your dashboard. The new Deal Dashboard constitutes a major upgrade for the platform. The dashboard is faster, more configurable, and more intuitive than ever. If you’d like a hands-on demonstration of how the new dashboard improves pipeline tracking for real estate investment teams, request a demo and one of our experts will be in contact shortly.